When you stay at Palmetto Vacation Rentals in Myrtle Beach, you'll be on the beach, within a 10-minute drive of Barefoot Landing and The Carolina Opry. This beach condominium resort is 8.1 mi (13 km) from Ripley's Aquarium and 8.4 mi (13.5 km) from Broadway at the Beach. Make yourself at home in one of the 60 individually decorated guestrooms, featuring kitchens with refrigerators and ovens. Rooms have private balconies. Cable programming and DVD players are provided for your entertainment, while complimentary wireless Internet access keeps you connected. Conveniences include microwaves and coffee/tea makers, and housekeeping is provided once per stay. Dip into one of the 3 outdoor swimming pools or enjoy other recreational amenities, which include a fitness center. Additional features at this condominium resort include complimentary wireless Internet access and gift shops/newsstands. You can enjoy a meal at the restaurant serving the guests of Palmetto Vacation Rentals, or stop in at the grocery/convenience store. Quench your thirst with your favorite drink at the bar/lounge. Featured amenities include ATM/banking services and an elevator (lift). Free self parking is available onsite. 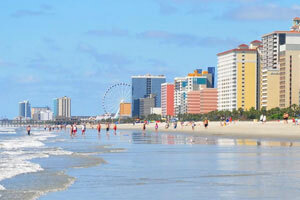 The preferred airport for Palmetto Vacation Rentals is Myrtle Beach, SC (MYR). Kingston Plantation is not affiliated with Palmetto Vacation Rentals. Guests booking with Palmetto Vacation Rentals do not have access to the Hilton and Embassy pools, including the sandy bottom pool by the Royale Palms and the Splash Park. For more details, please contact the property using the information on the reservation confirmation received after booking.